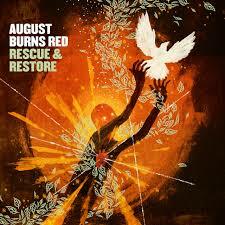 I still remember the first time I heard August Burns Red. I hadn’t been into metalcore for very long, but I was pretty impressed. After having listened to them, I was looking forward to “Rescue & Restore .” The Pennsylvania-based band once said something that I really appreciated, and I think this shows through in their music. Guitarist JB Brubaker said “Christianity is a religion, not a style of music.” Their other guitarst, Brent Rambler, once said “It is important to us that people know that we are indeed Christians… without having us stand up there and ram it down people’s throats.” This is exactly my sentiment when it comes to Christians making music. It shows through in the band’s lyrics, which are often deep and thoughtful.